France's June 17 elections gave the Socialist Party of French President Francois Hollande a commanding parliamentary majority, which nearly assures France will become the next European nation to legalize gay marriage. Hollande's Socialist Party won 314 of Parliament's 577 seats, giving the nascent president a free hand with which to enact his liberal reforms. The president can also rely on the support of 27 left-leaning candidates who also won legislative posts. Conservatives lost 111 seats in Sunday's elections. A Hollande administration backed by Socialist majorities means good news for supporters of France becoming the 12th nation to legalize gay nuptials. 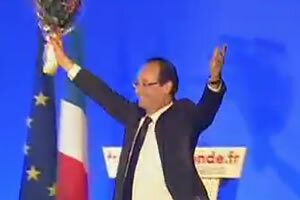 As a candidate, Hollande pledged to pursue such legislation. A communique issued last month by the office of Prime Minister Jean-Marc Ayrault to mark the International Day Against Homophobia and Transphobia (IDAHO) reiterated Hollande's campaign promises to the gay community. Currently, France recognizes gay couples with PACS, a form of domestic partnership which offers significantly fewer protections for gay couples than marriage. If approved, France would become the 12th country to approve such unions, behind Argentina, Belgium, Canada, Spain, Holland, Iceland, Norway, Portugal, South Africa, Sweden and most recently Denmark. England is also debating the issue.